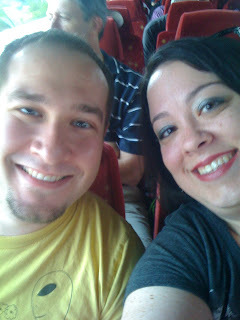 Joanna and her Amazing Technicolor Interwebs: WDW Trip Report - Day 1 - Hey Look! A Duck! After all the tweets, Facebook comments, and blog posts leading up to Kyle's & my Walt Disney World trip, I felt it was only fair to do a complete trip report when we returned. I didn’t expect it to be as hard for me to write as it’s proving to be. You’re going to have to wait for our last day post for me to fully explain, but I’ll go ahead and briefly say that leaving a close friend and not knowing when you’ll see him again is super hard. Connecticut and Texas are too far away! When I landed at MCO, Kyle had already landed, and we were in different terminals. A few texts and a phone call later (the first of many times that I proved I have no mental map), and we found each other. 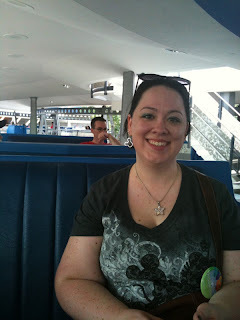 Yes, I felt awkward at first because it’s me, and I’m self conscious, but by the time we got to Disney’s Magical Express (the DME), everything felt natural. Laughter, smiles, and conversation were flowing quite nicely. In that year+ of chatting, we really had gotten to know each other. and we were checking into our room! I had secretly called and put our celebration of Kyle’s birthday (it’s June 27th) on our room reservation as well as our dining reservations, so he had a birthday button waiting for him, and we got an amazing room! First floor, near a quiet pool, just around the corner from a bus stop, and not too far from the front of the resort. I don’t think we could have asked for anything better. The front desk staff was super friendly. On the beautiful walk to our room, we excitedly pointed out the boating areas, main pool, and gorgeous paths. I also showed myself in true Joanna-form, and exclaimed, “Look! A duck!” Kyle asked where, and my response was a quick, “never mind! Not a duck! Just kidding! Just kidding!” Yeah, I had mistakenly pointed out a tree stump to him. *red face* We laughed about that most of the trip and constantly pointed out “ducks” from that point on. We didn’t take long to settle in our room and head to the bus stop to go to Magic Kingdom. After all, our luggage was going to be delivered in a few hours, so really it was shedding a carryon item or two and heading out. I do remember thinking that the double sinks were great and the room was super spacious. 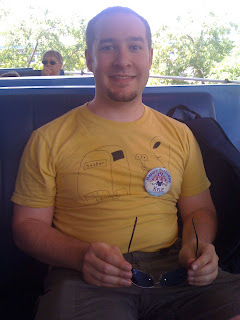 By the time we arrived in Magic Kingdom, Kyle was already hearing “Happy Birthday!” nonstop thanks to the button he was wearing, and as soon as we entered the Magic Kingdom, a Cast Member (CM) sang happy birthday backwards to him. Thanks to all our voters, we headed straight to the Tomorrowland Transit Authority Peoplemover for our first attraction of the trip. The ride was peaceful, allowed us to chat some, and had a nice breeze. It was a perfect start to an awesome trip. At some point we stopped for lunch at Pecos Bill’s which was good but fairly generic. Mostly it was about getting quick food and getting going on the fun! Outside of Pecos Bill’s I got “cookied”. Ya see, when you wear a birthday button, CM’s are constantly calling out “Happy Birthday!” and sometimes there are some perks. When we passed one CM, he gave the birthday call, and tossed a cookie to Kyle. What he didn’t realize was super uncoordinated Joanna was between said CM & Kyle, and I totally got hit by a cookie! From that point on I took a step back when CM’s started to speak to Kyle. Our first sit-down dinner was in Liberty Square at the Liberty Tree Tavern where we discovered that if I went to wash my hands in the bathroom, they would immediately call us for our table. ;-) The food was good, but it was not my favorite meal of the trip despite the fact that they sang to Kyle (who was starting to twitch nervously every time they came to sing to anyone around us). The beef was more tasty that the turkey and the sides were fairly good. Probably not a place I'd choose to go again. My favorites tended to be much more entertaining or have more out of the ordinary food. Our evening also included the Magic, Memories, & You Castle projection show. This was my first video of the trip, and I’m not sure what the clicking noise is, so ignore it, and you can get a bit of an idea what the show was like. I really liked it was impressed with the precision of the projections. Wishes, the fireworks show, followed shortly after, and while we got stuck behind a tree, it was still beautiful. Yes, I quietly sang along. Doesn't everyone do that? 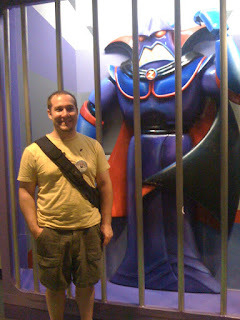 We ended the night with a few more attractions, but we were both totally beat. We’d both gotten up around 5 that morning, and bed was sounding really good. Once we got to the room, we unpacked a little and pretty much passed out. Next post: We’ll head over to Hollywood Studios, enjoy a night with Yehaa Bob, and I’ll share what surprise we woke to on our second morning! Trip report posts will be posted about every 2 days, so be sure to come back soon!